Vice President for Research Robert Miller said the suggestions in the report will help officials facilitate research projects. A faculty report released last week encouraging the University to simplify its funding processes and clarify research standards could help officials in an ongoing effort to bolster GW’s research reputation, faculty and experts said. The six-page report published by the Faculty Senate Research Committee suggests several ways for the University to improve its research environment, like streamlining the pre- and post-award processes and expanding funding opportunities. Faculty and research experts said the report’s recommendations will expedite the grant application process and ensure researchers comply with University and federal policies – making it easier for professors and students to conduct and publish research. Robert Miller, the vice president for research, said suggestions in the report like increasing researchers’ salaries and simplifying the award acceptance process will help officials facilitate research projects. He said officials have already instituted some of the recommendations outlined in the report, like implementing an online system to track compliance issues and increasing the number of staff and faculty training sessions about research ethics and federal funding guidelines. “The report will be an important guiding document as we move forward and prioritize next steps,” Miller said in an email. The first phase of the faculty-led review, which began in September and concluded in January, evaluated how the University can improve its research ecosystem in four main areas – pre- and post-award processes, research integrity and compliance, and non-sponsored research and scholarship. Miller said officials will present the findings from the second phase of the review – which will include an evaluation of shared research facilities, computing infrastructure, resource allocation and workforce development – in 2020. Officials selected faculty working groups to lead the next assessment after faculty and staff from the Office of the Vice President for Research and the provost’s office completed the initial phase of the review, he said. “We are thankful for the faculty’s involvement in the first phase of the ecosystem review and for the feedback,” Miller said. The review falls in line with University President Thomas LeBlanc’s mission to boost GW’s reputation as a prominent research institution. The working groups recommended implementing automated systems to track researchers’ awards, expedite grant approval processes and allow researchers to begin working without unnecessary delays. Jamie Cohen-Cole, an associate professor of American studies who led the non-sponsored research and scholarship working group during the first phase, said the proposal’s suggestion to eliminate some post-award processes, like detailed expense reports, will free more time for researchers to investigate their projects. “In some sense, it’s a way of brushing away unneeded rules, regulations and bureaucracy and changing the culture of GW to be more flexible and nimble and responsive to the people who are engaged in education and in this portion of the review, the research part of the University’s mission,” he said. The working groups also recommended that the University maintain “clear, consistent and effective communications” with head researchers throughout the proposal and submission processes, including additional training for lead investigators and research staff. Research experts said training investigators to comply with ethics policies and facilitating clear communication between researchers and project sponsors will construct a well-functioning research ecosystem. Edward Hackett, the vice provost for research at Brandeis University, said improving communication between sponsors and researchers will fix issues like missing proposal deadlines. 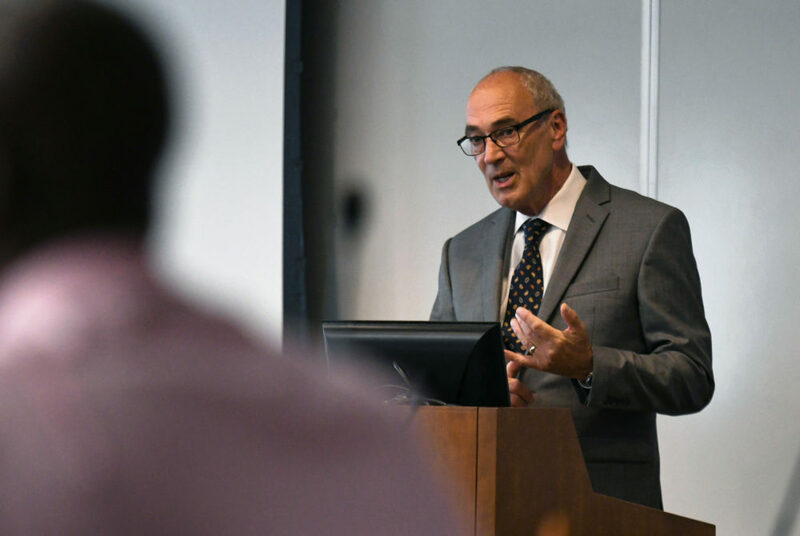 “There’s a really powerful interface between the substantive researchers on the one hand and sponsors on the other, and what GW’s trying to do is strengthen that cadre of professionals who are the linkage between your campus and sponsors,” Hackett said. The proposal also suggests a more equitable distribution of resources between sponsored and non-sponsored research projects. Over the past three fiscal years, more than 70 percent of the University’s research funds were allotted to health-related research, and less than 1 percent of funding was allocated to research in the arts and humanities. Stephen Lanier, the vice president for research at Wayne State University, said universities need to equally support science and humanities research projects even though the latter typically receives less federal funding. “University leadership needs to recognize that and have programs in place to nurture not only those programs that are going to be getting big grants and contracts, which are of critical importance, but also that are always to nurture student activity and faculty activity in the humanities,” he said.